A grlorious tribute to New York - the city that inspired Will Eisner's greatest works. Before the East Side was cool, there was the grit and grime of Avenue C, a world filled with street musicians, overflowing sewers, ans peeping toms. 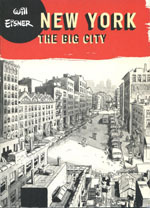 In New York: The Big City, Will Eisner presents a series of vignettes built around the elements that make up a metropolis- the poetry of it's buildings and people , it's trash and treasures, all recalled in Eisner's unforgettable style. Born in Brooklyn in 1917, WILL EISNER was the author of the legendary comic strip The Spirit. He lived and worked in New York City for several decades before "retiring" to Florida ans pioneering the very first graphic novel. The comic industry's top annual "The Eisners", are named in is honnor.